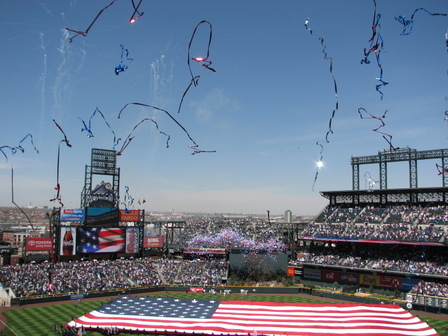 Since 1993 we have only missed two opening day games. For many years we or someone in our family attended almost every home game. Now the kids are married and busy with careers and their own children and we simply cannot use 81 games so we trade and share until we have about 26 games + the fireworks games. That's about right for us. These photos taken yesterday from our upper level seats. After testing our flying motto, "Be patient, be flexible," by standing by for 5 flights in Salt Lake City, we finally got a hotel there and were able to get out the next morning on the COD (crack-of-dawn) flight to Denver. 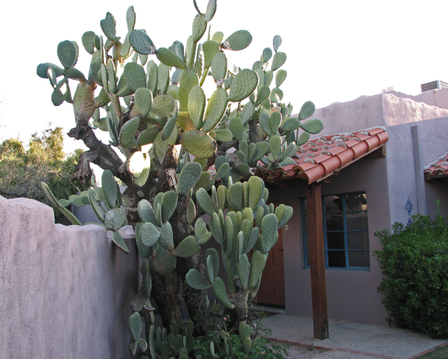 We were tired but had happy memories--and way too many photos of cacti-- to remind us of our quick 3-day dash to Tucson. My husband found a too-good-to-be-true car/hotel combo deal on Expedia and luckily it was most definitely a true deal. It also acquainted us with a wonderful historic lodge located just a few blocks from the continuous free shuttle to the games. 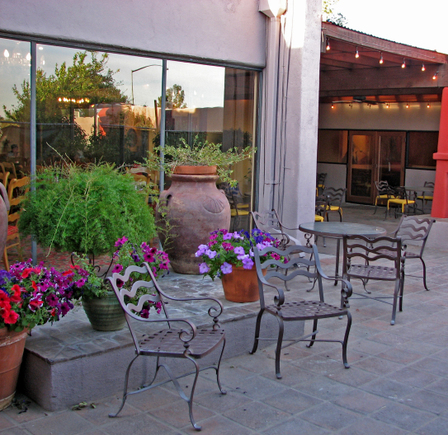 Before we saw the restaurant at our motel we had wondered where we would eat the first night in Tucson. We picked up our car at the airport, checked in at the motel, changed our winter clothers for sunshine clothes and made it to the game in time to see the first pitch. When we checked in we walked past the restaurant and immediately decided to eat there after the game. 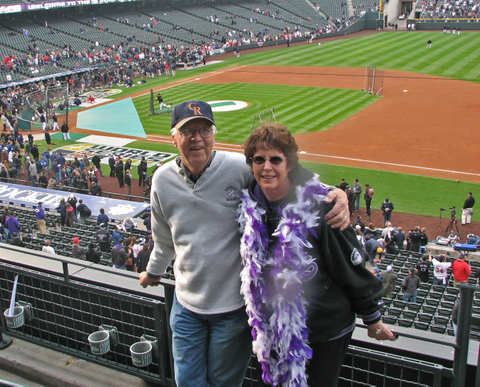 Bob and I before the first game in Colorado--yesterday!!! What a thrill! I've never been to a World Series Game and to be there the first time that our beloved Rockies have gone to the Series was fantastic. The crowd was great. Both Rockies and Red Sox fans supported their teams without booing the other team. There was almost no casual conversation and most people stayed in their seats the whole game. Everyone followed every pitch and every play on the field. It was great baseball. Of course I would have loved to see our team win or at least take it to seven games but the Sox have a very talented team and their pitching was awesome. Representatives of the armed forces presented a giant flag. The flag was carried in and unfurled on the field and remained so while Carrie Underwood sang the anthem. After the anthem the team members were announced and the game began. It was so exciting. We watched the other games at home with friends over. When my dear friend Paula heard that we'd gotten tickets, she brought over the boa that I wore to the game. With the high winds and my jumping around, I brought the boa home a number of feathers lighter than it appears in the photo. The two teams lined up along baselines before the game. 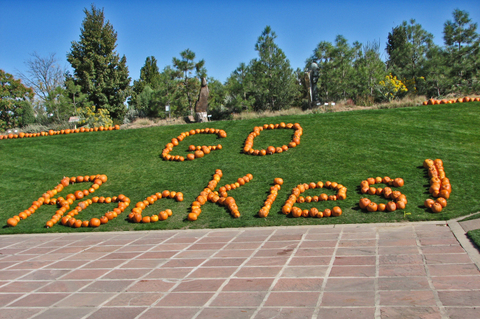 Pumpkins spell out local sentiment at Denver Botanic Gardens. As those of you who read this blog are aware, we are long-time season-ticket holders of the Colorado Rockies baseball team. Not sure we wanted to obligate the money before the play-in game to the play-offs, we passed on the package. Now the Rockies organization has said that Season ticket holders who have not previously purchased Series tickets will be able to purchase them on Sunday, Oct 21 from 1-5. We will try. The word Rocktober appeared on fan-held signs during the playoffs. 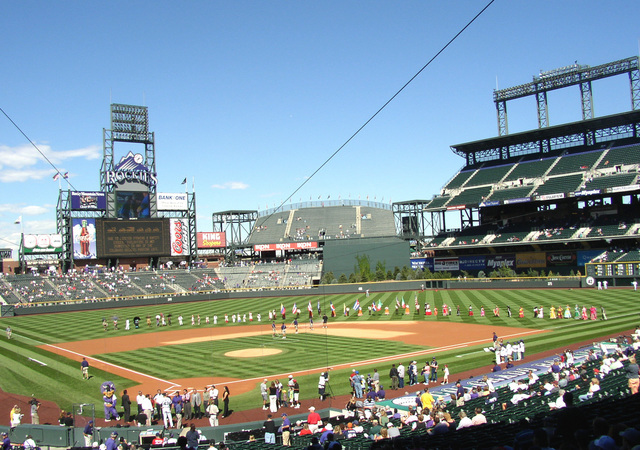 Now the Rockies Organization has applied for a Trademark for the term. Expect shirts bearing this work hot off the presses soon. If I can get one to wear to the games that I hope to get tickets to, I will. If not to the game, I'll at least wear it to an in-home Series TV party. I have not seen this town so excited about anything since the John Elway Superbowls hoopla. 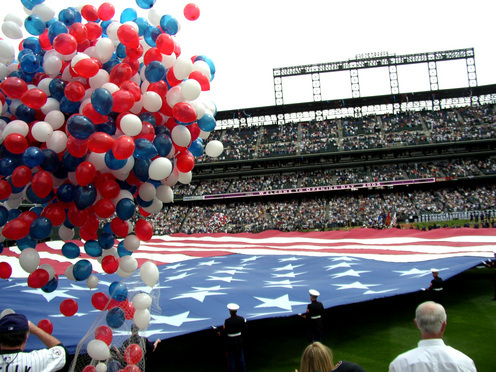 Today we experienced our 12th Opening Day of the 13 seasons that Major League Baseball has been in Denver. I never expected to be a baseball fan, at least not such a baseball fanatic. Yet here I am 12 years later counting statistics and keeping score like a lifelong follower of the game. I love the optimism of each new season. It was especially thrilling today to have the game end in our favor with a bottom of the 9th walk-off two-run homer. Rockies won 12-10. 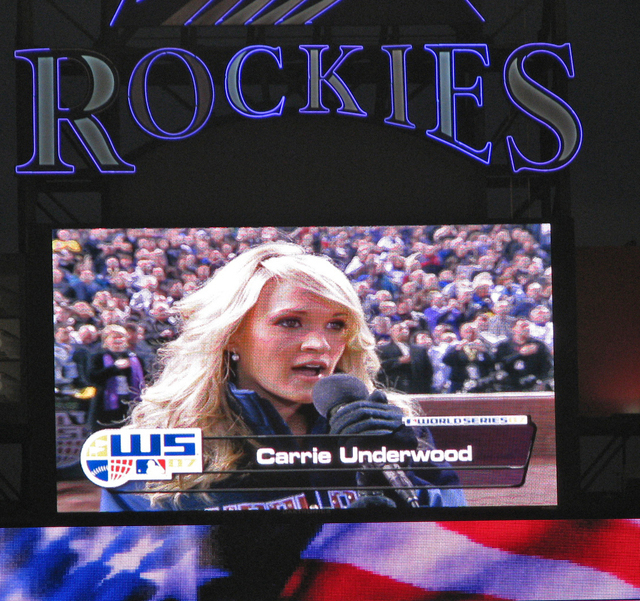 I have only one pet peeve with baseball: Beginning in 2001 after 9-11, someone in MLB decided that religious songs like God Bless America and America the Beautiful should now be played at the Seventh Inning Stretch. I love my country and proudly mouth the words while someone who can carry a tune sings the Star Spangled Banner, but I balk at God blessing only our country or shedding his grace at a sports event. They are both beautiful songs but they are "religious" songs. Do other people also run to the concession stands while Baseball plays a commercial for God to a captive audience? Am I the only one who is bothered by this? 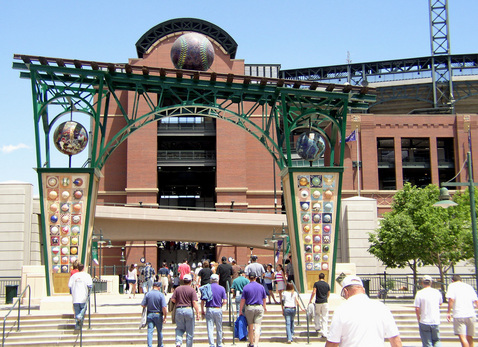 Rockies fans entering Coors Field beneath the Evolution of the Ball. 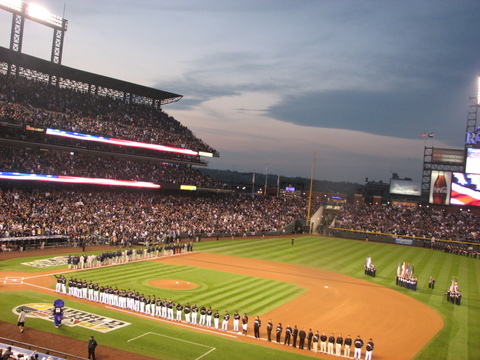 One week from today will be the 2005 Rockies Home Opener. 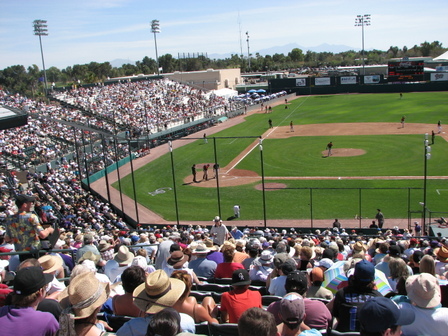 Last year we had decided that we would no longer be able to use or sell 81 home games of season tickets and financially could not justify the expense of behind-home-plate lower-level seats. 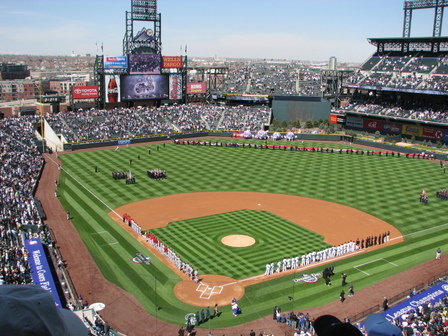 We struggled all year with the thought of giving up our seats and our priority number that began when Major League Baseball arrived in Denver in 1993. When the phone call came asking if we wished to renew and Bob said we simply were not able to use 81 games, the enterprising young man in the Rockies sales office suggested we buy season tickets in the outfield and trade them up for our regular seats--or nearby--for as many games as we chose. We did. We are now scheduled for 24 games in the same seats we've had for 11 years--plus 5 games that we are not able to trade--and we retained our priority number. Next Monday on opening day we will be among those marching under the baseball sculpture above to our left field seats for Opening Day. It's a win-win for us and for just 1/3 the cost. 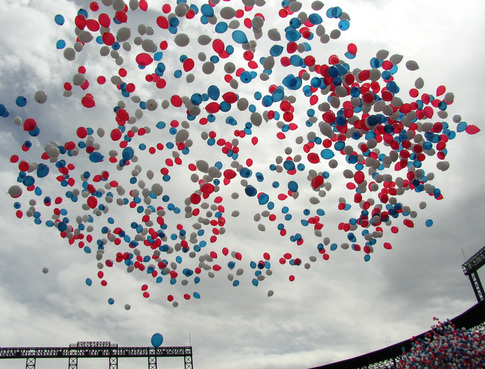 Only a baseball fan can understand the total optimism that permeates Opening Day. 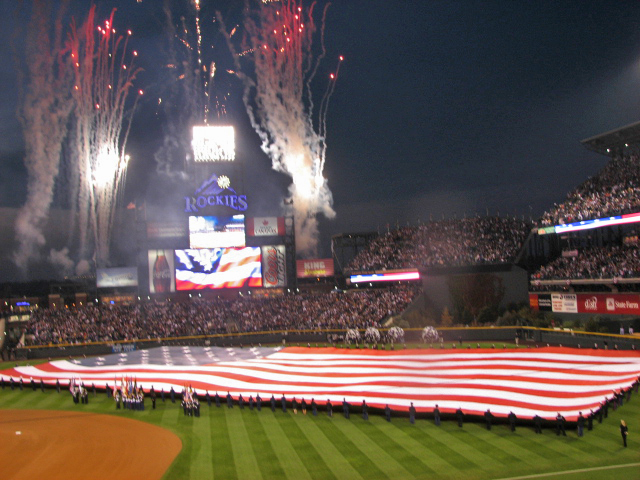 This could be the year for the Rockies! Who knows? Loyal Rockies fans, almost 27,000 of them, turned out to salute and forgive the players for all they did and did not accomplish this season. As the players walked around the warning track after the final game of the season, we especially applauded the ones we suspected would not be in the black and purple uniform next year. We had our last Burrito Bowl at Blake Street Burritos--the only stadium food I enjoy. As we left the ball park we joined in the rally cry of the eternally optimistic baseball fan: "Just wait until next year!" It was a bit bittersweet this year as we are seriously considering giving up our season tickets for next year. We just can't make all the games and parceling them out to others is just too time consuming. We will still attend games but will be more spontaneous in our attendance as we want to be less tied to home with more freedom to travel both in our motorhome and internationally. Not one to dwell on lost opportunities, I came home and immediately started laundry to begin packing for our trip to see our new grandson on Friday. He will be two weeks old the day I hold him for the first time. The quality of this photo is not representative of the fascinating sport spelled out on her sweatpants. My camera was incapable of catching the lightening-fast kicks and turns achieved by the 8 men and 5 women in the class. Ligia attends a 2 1/2 hour session three times a week. It requires amazing strength, skill and discipline to perfect this hybrid of dance and martial arts. A fairly complete history of Capoeira can be found at this link. But to get the real flavor of the dance element you must watch the movies at this link. I first witnessed Capoeira in Salvador (Bahia) Brazil in 1992. It is absolutely amazing to watch the participants kick within inches of their partner's nose--at a terrific speed--without touching it. A former guest Joao practiced the slower form, Angola, which is quite dramatic and requires a different type of strength to hold the positions longer. The Regional, pronounced heejenow, is the more rapid type practiced by Ligia and and featured in the training movies. In some of the movies you may see a bow-and-arrow type instrument with a gourd on it which is played with a stick to provide a rhythm for the dance. Whenever I travel, whether domestic or international, I always try to catch the locals "dancing." There is cultural education in both the steps and the music.